Free New Tool provides your clients PROOF your care-plan is working, increases client adherence to your plan by as much as 143% & helps clients see their RESULTS... faster--all while you work less making more getting paid what you are worth! If you believe a fully engaged client with an increased role in their health makes for a healthier, happier, lifelong client and a more fulfilling and less frustrating practice for you... then this is absolutely the most important letter you will discover and read all year! If you are like most in your field, you consider yourself a pretty good practitioner. Maybe even a great one. 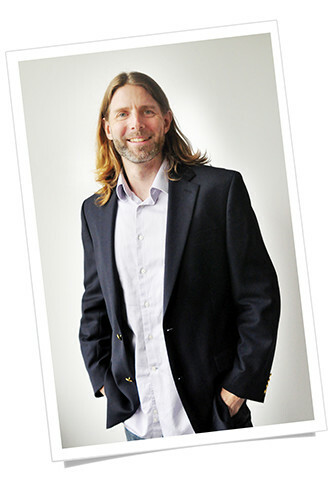 You’re experienced and you’ve put together great solutions for you clients…they are in good hands with you. Obviously, like most good practitioners, you want nothing more than for your clients to feel better and perform at their best, right. Do you ever feel your patients/clients secretly question whether your plan-of-care is actually working for them or not? Do you struggle to sell additional care and services when needed because your clients do not SEE the benefits your care plan provided? It can be totally disheartening and frustrating to get this from the clients you work so hard to help. As you are well aware, there is a REVOLUTION happening in healthcare today. We’re in a national crisis... obesity, sugar, GMO foods, bigger and bigger problems healing, sapped performance... our immune systems are shot. In July 2014, Forbes ranked the U.S. 11th out of the top Commonwealth Nations in health care and ranked LAST in every category including quality care, access, efficiency and cost. I’m sure this does not surprise you in the least. According to the New England Journal of Medicine (2010), the United States ranked 37th for overall health... 43rd and 42nd for adult female and male mortality respectively yet in 2006 ranked number 1 for health care spending per capita. The average person in the U.S. has it bad... paying the most for some of the poorest results. People with hard to diagnose and treat issues have it even worse... they are nearly locked out of the system altogether. As a practitioner you see this problem everyday and the general public is beginning to see it too! Going cash and cash-friendly is the new trend in health care. More and more people realize the linear approach of pills, surgery and ‘silver bullet’ medicine are not always the best solutions for them. Clients want to know the root cause of their ailments and the triggers that make them feel worse. People are desperately searching to find alternatives like YOU! ... and they instinctively realize that things like diet, nutrition, lifestyle and activities have huge impacts on their health... there’s a big disconnect between the buy-in and the real-world implementation of this philosophy. It’s a real challenge for them. At times they feel they are blindly throwing darts at the board. Your clients believe the ‘holistic’ and ‘functional’ approach is a fantastic solution for them but find it difficult to follow through once they leave your office. Client buy-in over the long term must happen for successful outcomes. Do you ever feel you can help your clients so easily but many times feel as if they resist your plan...even after they pay and go through the education? Why do they not follow your lead? It’s not magic after all. Your best clients follow your plan and get the results they want. But many clients get off track and don’t follow your plan. As a result, they don’t improve, and neither you nor them are happy or satisfied. There’s no denying it; failure feels awful. It’s no surprise that the practitioners who consistently get their clients to buy-into their plan at the beginning of care AND get ADHERENCE over the weeks and months implementing the plan are the most successful practitioners. When buy-in AND adherence happens, successful outcomes increase, satisfied clients increase, higher quality referrals increase, and your income increases! Clients MUST take an active role in their health. You cannot do it without them. But how do you get your clients to consistently take a more active role in their health over the long haul? In January 2015, Inc. magazine ranked health tracking and data collecting two of the top 5 consumer health trends of the year. Many clients want (and NEED) to see PROOF care is working before they can totally buy in. Which leads us back to you... the practitioner. Are you providing the proof clients crave? If not, this could be one of the problems why you are not seeing the results you consistently want with your clients and your practice. Do your clients fail to connect the dots between your care plan and how they feel? Do you want your clients to get better AND to recognize that your care plan is what’s helping them? Do your clients want to see undeniable PROOF that they are getting better because of your guidance, knowledge and expertise? Do you want to be paid what you are worth while helping the people who need you most live better, more comfortable and normal lives? Through data tracking that works in concert with your plan-of-care you can provide the proof your clients desperately crave and need. Our cloud-based software gives your clients the piece of mind that they are on track even between visit with you. Our goal is to transform your practice without you doing much extra work at all. Your care plans will be respected and adhered to more closely. Your clients’ trust in you will skyrocket. Buy-in to additional care when needed will increase as much as 50% to 100% without any hard selling! Client outcomes and results from your care plans will be stronger and happen faster! Referrals will increase by as much as 75% to 200% (and be higher quality referrals too). All while your income increases! 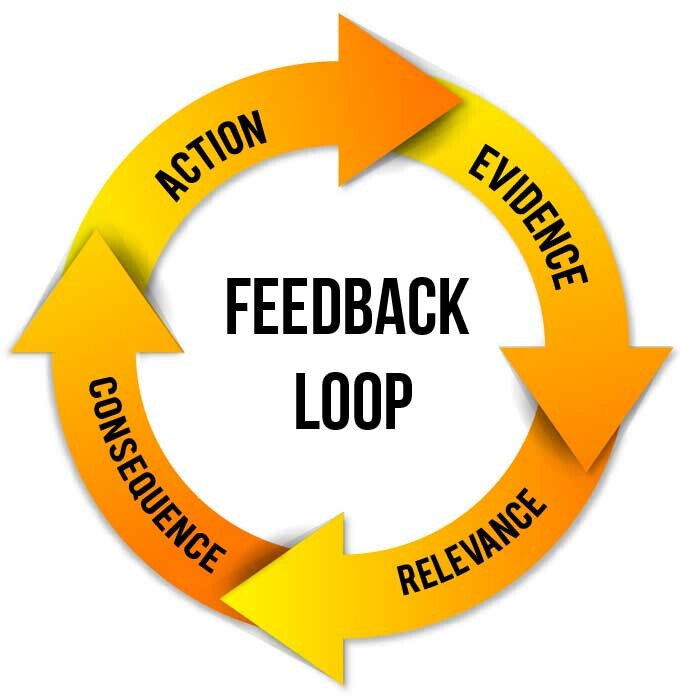 Psychologists have proven time and again that Feedback Loops change behavior. When a person SEES the link between their actions and the resulting outcomes of those actions, they are compelled to buy-into the idea. Here’s a good example of a Feedback Loop. The city of Garden Grove, CA couldn’t get divers to slow down for a school zone... radar camera’s couldn’t do it, the thought of injuring children couldn’t do it and officers with radar guns couldn’t do it. Despite their own best interest and children’s safety, people continued to speed dangerously through schools zones. So what did the city do? They posted a simple feedback loop for drivers... a sign displaying the speed limit and another displaying, “Your Speed” and the driver’s current speed using radar. Mission accomplished: the average speed of divers dipped below the speed limit in the school zone. Feedback did what danger, enforcement and threats could not... it gave drivers a gentle reminder of the rules of the road and the CONTROL to change their own behavior. In other words it gave them the PROOF they needed. We built this same type of feedback and fundamental accountability into the system! It all happens seamlessly and automatically with little additional work from you or your staff. By giving your clients their own tracking dashboard (that’s linked directly to you), you give them something VALUABLE they’ve never had before... a way to VISUALIZE all aspects of their life. They can track ailment severity, life factors and activities and see how they all interact with each other in beautiful charts and graphs. This is not something totally new... most practitioners encourage their clients to track their diets with pen and paper. By capturing this data, you’re making this information extremely useful! It’s easy and intuitive taking less than 60 seconds a day for them to enter their data. Your client gets feedback along with the incentive, motivation and IMMEDIATE GRATIFCATION they need to participate in their health in a serious way. They can see their outcomes with their own eyes... pieces of their health that were once a mystery and invisible to them are now right before their eyes. They have a tool that shows the outcomes that result when they adhere to or stray from your plan of care. And you gave it to them! You can give your clients the piece of mind that will help transform their lives. But this is NOT for every practitioner! This is NOT for you if 80% of your patients/clients already adhere to your care plans and are reaching positive outcomes in the time you expect. This is NOT for you if your current “drop out” rate is less than 5%. This is NOT for you if your additional care when needed buy-in is over 75% and accepted with little resistance. It’s very simple and intuitive. You get a customized, just for you, control panel, which allows you to see up to the minute diet and life activity tracking of your clients in visual charts and graphs. Simple to use and well organized. It comes with the ability to communicate directly with clients through their user dashboard so they can stay focused on your care plan and outcomes. This means, your client is assured someone who cares about them and has their best interest at heart is watching between office visits. 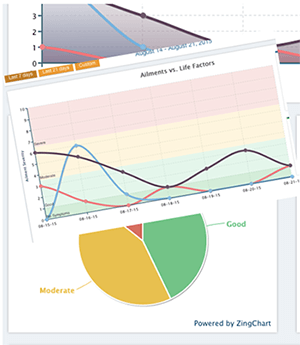 Access up-to-the-minute client ailment and lifestyle charts, graphs and messaging system from anywhere in the world! Securely message clients right on your client’s tracking dashboard. Increased communication and accountability is proven to increase adherence to care-plans and leads to increased additional care buy-in when it's needed. Your clients are assured a person who cares about them is always watching out for them. Through the GDD dashboards you are connected to clients long-after care is complete! This added value and convenience helps make you their go-to solution for health and performance. Clients always have access to the tracking and communication system so you are ALWAYS just a click away for additional care and referrals! Your clients get their own easy and intuitive tracking dashboard and visual charts that’s connected directly to you. They get instant feedback and insights from the system automatically and additional motivation to adhere to your care plan. Clients are mesmerized by watching the impact their diet and life activities have on their ailments and performance. You have more engaged, happier and ultimately healthier clients. We are in the final beta testing phase of new software that helps patients see how their plan-of-care is making them feel better in all phases of their life. We feel it’s the absolute best software on the planet that bridges the gap between the plan-of-care prescribed by you and the health benefits the client feels... it gives visual representation to what before now was just a “feeling” inside of the client. They have something they can see and you have something to point to! Trust increase. Adherence to your plan increase. Satisfaction increases. And most of all, the client gets better results... faster. From there, referrals increase, your rates increase and continued care opt-in increases. We are looking for 10 integrative, functional and holistic health practitioners (nutritionists, holistic, integrative and functional medicine practitioners, dieticians and food & performance coaches) for this phase of testing. This is absolutely free for you and your clients and you get to see this before most other health practitioners. Your feedback will help shape the software into exactly what you want from it... for you, your staff and most importantly, your clients. Go ahead and signup below... you will be on the early bird list. A maximum of 10 practitioners will be accepted so we expect the slots to fill quickly. Once you apply and the doors are open, you will hear directly from a Guidedogdata staff member letting you know if you’ve been accepted or not. If you are accepted you will be giving a unique invite link to register along with instructions on how to proceed.